My father worked for Ovaltine in the UK for a while at the beginning of the 1960s. It seems he bought some copies of these Ovaltine postcards home. I must admit these imagines generate more than a little cynicism in me. I sense marketing rather than reality lies behind them, the same kind of marketing that has many contemporary food companies claim ‘country fresh’ on their products because they site their industrial food–processing factories between villages. That people buy products for such dubious illusions seems nothing new. I wonder what was his opinion of the cards (he died a few years later)? Perhaps the clue is the fact that many remained unposted, for me to find half a century later. Maybe not: he might simply have taken them as a memento when he left. Times have long since moved on, as wikipedia document. Ovaltine is no longer made in the UK. The Egg Farm is now a wind farm (cue silly jokes). Another farm became a kink in the M25. The factory is now flats. 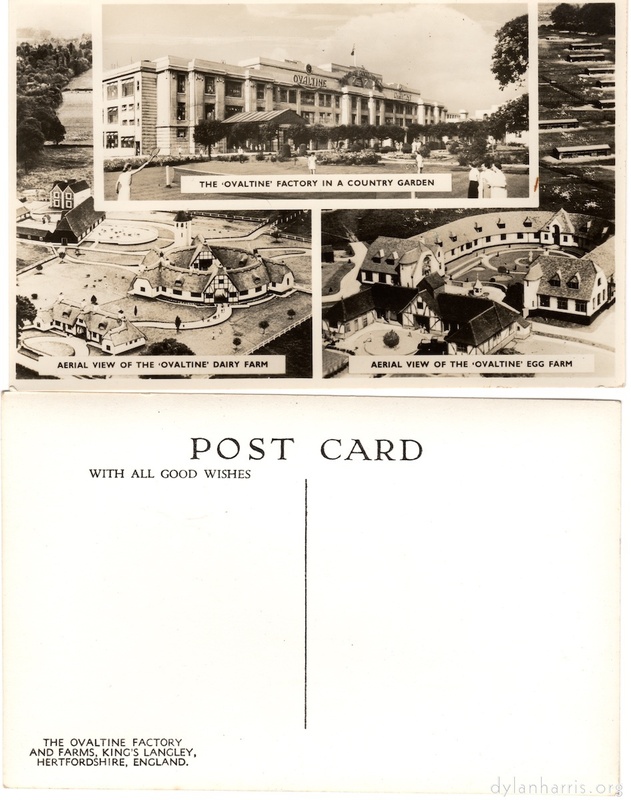 Enjoy the postcard for what it is, a memento of simpler times.